Open the SoftProof application and load a job, or load an image by selecting a job in the QueueManager and choosing View Original/Imaged. Select the Channels icon in the left menu bar to open the Channels widget. 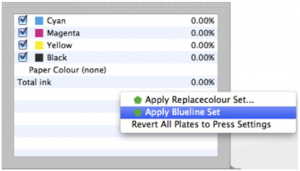 Right click in the Channels window and select Apply Blueline Set. Your preview will now change to varying shades of blue. Select Revert to revert all channels to the original view. Any changes here are only changes to the preview. The job is not altered in any way unless the job is submitted from the SoftProof application with the change. Blueline effect is not available for RGB jobs.